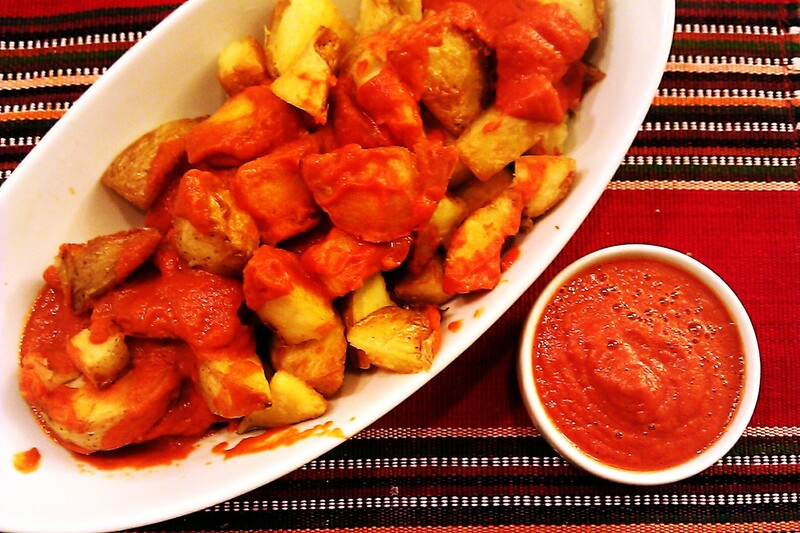 The first time I tried Patatas Bravas was at a Spanish tapas restaurant called Picasso’s. The sauce is spicy but not too spicy that would render the dish not enjoyable after a few bites. I’m not into very spicy foods but I find I can continue enjoying the salsa brava with the crispy potatoes and not feel overwhelmed by the spiciness. It’s a really delicious sauce and fun to make. Bring 4 quarts of water to a boil and cook potatoes until soft. Note: since potatoes are cut into pieces they will boil soft very quickly. Check your potatoes that they don’t over cook. In a large skillet add enough oil to fry all your potatoes. Fry on HIGH until browned and crispy. Put potatoes in a serving dish and remove excess oil with a paper towel. In a large skillet heat oil at LOW. Add the onion, garlic and cayenne. Fry until soft. Do not burn the garlic. Add the flour and stir for 1 minute. Add the tomato and increase heat to MEDIUM and cook for 5 minutes stirring occasionally. (If you do not have a high performance blender such as Vitamix cook the tomatoes for 10 minutes.) Add the sugar and cook 5 minutes more. Turn off heat. Stir in the white balsamic and salt. Put the sauce in a high-speed blender and blend until smooth. I blended on HIGH for 2 minutes until piping hot in my Vitamix. Recipe adapted from the amazing acorn in the kitchen blog. This looks really interesting & easy enough. I’m putting this on my list & I appreciate the heads up on the sauce since I might not have tried it until you mention that it’s not overly spicy. I like flavorful but not kill the tastebuds so this looks very enjoyable. Nice, I’m thinking to try this soon! If memory serves, I think I’ve also had these sprinled with paprika and garlic. I’m pleasantly surprised how nice the salsa brava turned out. Paprika and garlic to season the potatoes too sounds good! what a bright wonderful colours in this dish. It looks incredibly appetizing. Yes, please try. It turned out quite good!